Spring and autumn are my favourite seasons. A scorching summer day brings me out in freckles, or maybe some painful sunburn if I’m particularly lax about larding on the Factor Anorak. Winter is better, but I prefer mild and wet rather than those icy cold days which make my hands contract inside the sleeves of my duffel coat, like a chap’s undercarriage when he takes part in the Ventnor Boxing Day swim. No, give me the temperate seasons any time. In autumn, I’m back to wearing socks and legwarmers, kicking through leaves whenever I have the chance. 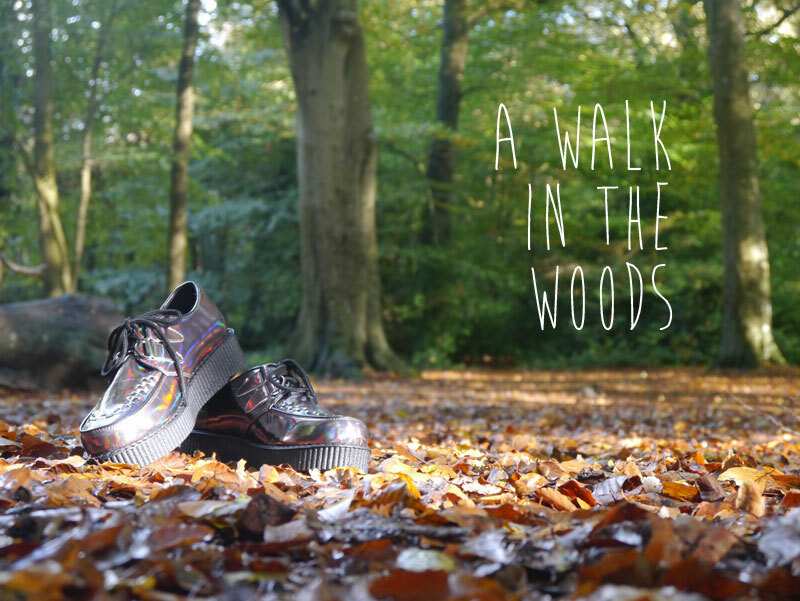 To raise me through the puddles, I like a platform sole and what better shoe to provide decent height (without instability) than creepers. I have owned <coughs> quite a few pairs, one or two of which I have actually destroyed by running in them – those soles sometimes protest when over-flexed! But generally they’ll endure longer than Bruce Forsyth on Saturday night telly. 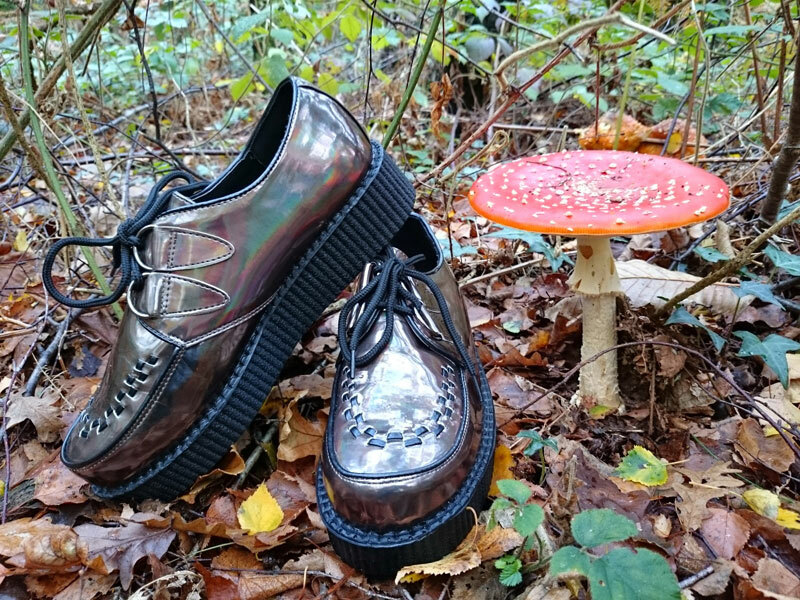 You’ll already have admired my gorgeous silver iridescent creepers shipped to me from America by those nutters at Dolls Kill. Well, I have another pair now – in a more autumnal bronzey hue but still with that head-turning iridescence. These beetle crushers may be a right pair of chunksters, but see how that fabulous fly agaric fungus looms over the left one – that’s one towering toadstool, fungus fans! Hologram petrol creepers, Ebay, £14.99. One pair of my creepers that’s had an intimate association with Araldite is these well-worn and supremely comfy silver metallic jobbies. As I have had them a couple of years, they probably count as vintage now; a bit like your mum. As I said, not great for running in (though the sole and upper were successfully reunited with a squirt of the old two-pack cement from Hursts) but pretty head-turning. 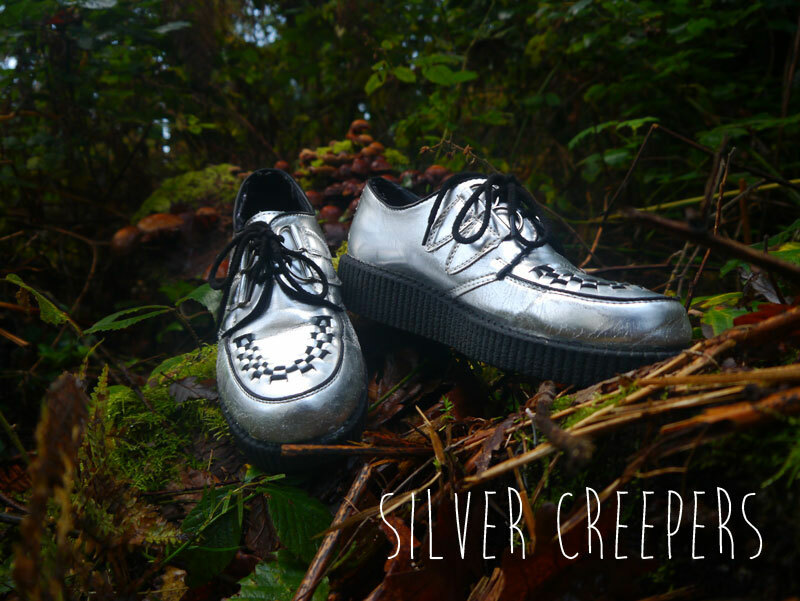 New Look silver metallic brothel creepers, £12.50. If your walk in the woods includes some adventurous tree-climbing or, at the very least, an encounter with a stile, you might need something a bit more flexible. 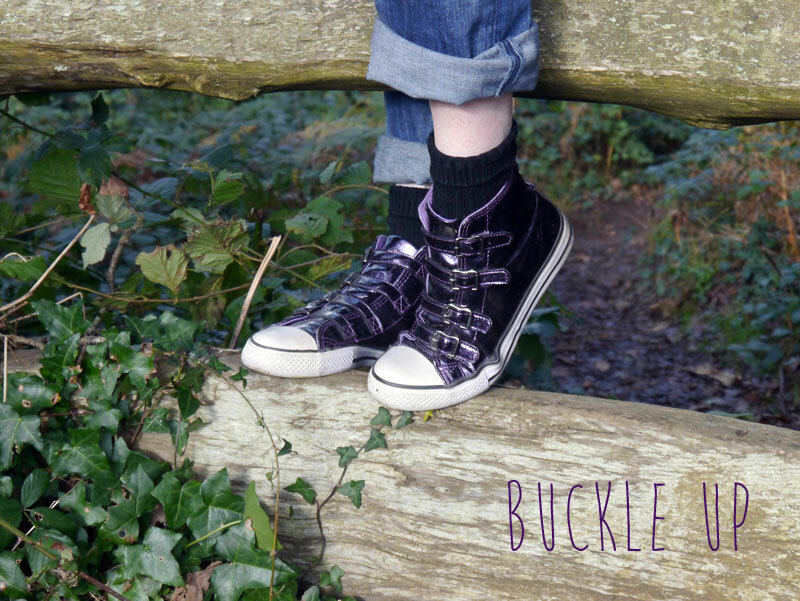 Obviously still with the requisite amount of bling, these purple glitter sneakers with multiple buckle detail are just the thing for providing a suitable amount of grip when straddling a length of cleft chestnut fencing. Purple Atmosphere (Primark) trainers, car boot sale, 50p. 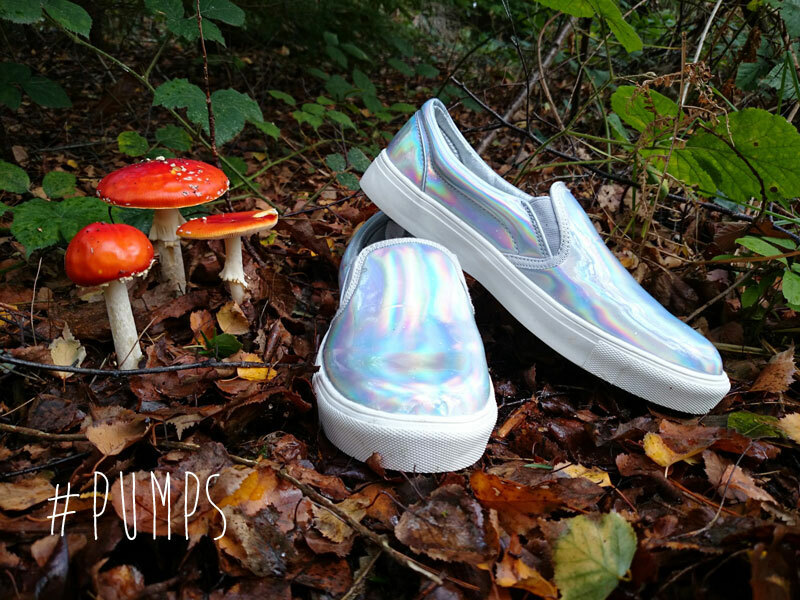 It’s almost impossible to admire these flat iridescent pumps with those showy fungi making a decent fist of stealing the limelight. However, turn your attention from the red-capped glories for a moment and look at the shiny shoes. 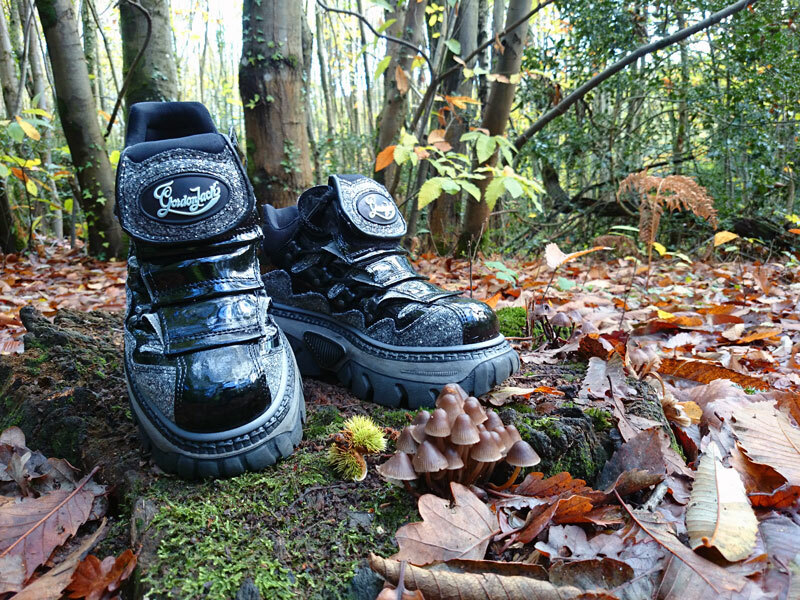 These’ll do for a stroll around the forest but make sure you stay out of the puddles; they’ll soon be breached if you step into a deep one. Silver hologram pumps, Primark, £6 (in the sale. RRP £12). If you thought the creepers were designed to crush everything underfoot, you ain’t seen nothing yet! These colossal Gordon Jack platform trainers are a mighty shoe. 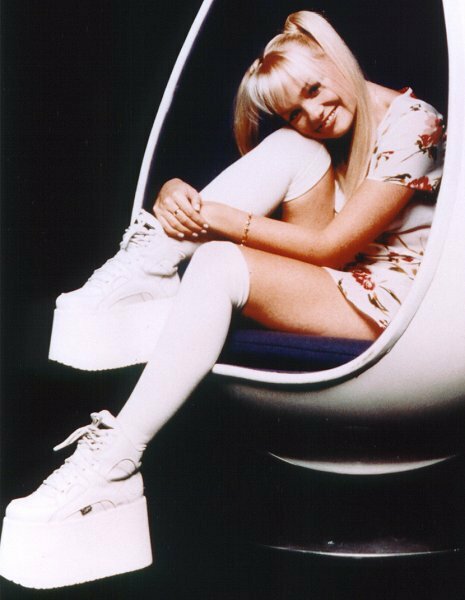 I’ve had many pairs of these Spice Girl-style stompers and some of them have, alas, had to be retired – though not through wearing out on the soles, but the uppers eventually being poked through with excess toe rubbage! Anyways, these fabulous glitter and black patent skyscrapers, are da bomb. These surprisingly comfortable überclogs work best under flares and, at the very least, bootcut strides. So until those two types of trouser come back into fashion these boots will probably stay in their cabinet in the Wight Catwalk shoe museum. Glitter and patent Gordon Jacks, £40 (or thereabouts), no longer available. Photographed on location in Parkhurst Forest and Borthwood Copse, Isle of Wight. Thanks to Matthew Chatfield, shoe sherpa and photography assistant. And now, a little light music.